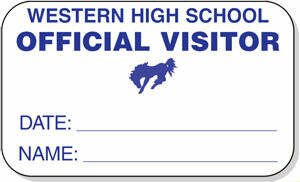 Lee’s has a parking permit solution to meet your institution’s or school’s requirements. 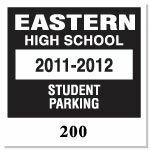 We offer a wide variety of parking permit types, shapes, designs, and materials. 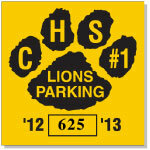 Choose from any of our customer favorite parking tag, parking decal, parking sticker designs and standard print colors. 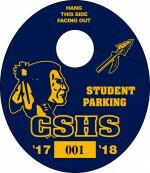 If you cannot find a parking permit design from our list of customer favorites we will create a custom permit with your mascot, emblem or logo. 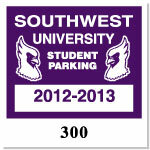 Customers love our personalized service and custom design parking permits. FREE STANDARD MASCOTS – With all permit types. 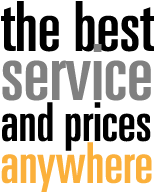 Use one of our standard mascots. Call or e-mail for additional standard mascot designs not shown; supply us with a mascot in vector art at no additional charge. 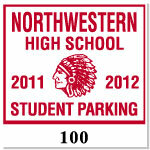 We can customize a tag or decal with your seal, logo or mascot for an additional $45.